Newsletter 157: Big and cool! And since we're talking about big and cool things, this week we also have another two big and cool kits, a new Ferrari GTO and the Porsche 917 both in 1/12 scale (that is, VERY big!) from Model Factory Hiro (that is, VERY cool! 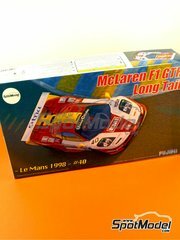 ), to tag along the 1/12 models we introduced you last weeks. Tabu has released new and freshly printed decals for the Tamiya Lotus 107 kit, at the same time that Studio27 has reedited in a limited edition the carbon fiber decals for the MP4/4. Ok, they're not really big, but... what about cool? A lot!! Equally big (over A4 size) and cool are the historic photography books from Model Factory Hiro, with three new issues covering the history of the FW15c and many 1968 Formula 1 GPs. And what about Eddie Lawson's YZR500? Big Eddie, and utterly cool kit!!! Go big and cool with SpotModel! 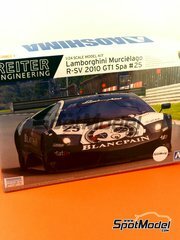 Inside the box you'll find a good pile of pieces for building one of the most beautiful cars of the last years. Gulf decoration is very nicely developed, with a thorough decals sheet and every detail you could need, and the kit also includes photoetches. The No. 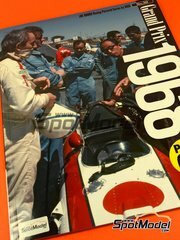 38 issue of Racing Pictorial Series by HIRO is focused on the Grand Prix 1968 F1 season. From the death of the symbolic driver Jim Clark, the rising of the Ford Cossworth DFV engine, the aerodynamics parts such as the high wings debuts, to the sponsorship from tobacco companies, this year is one of the turning point of the motorsports history. The No. 39 issue of Racing Pictorial Series by HIRO is focused on the Grand Prix 1968 F1 season. From the death of the symbolic driver Jim Clark, the rising of the Ford Cossworth DFV engine, the aerodynamics parts such as the high wings debuts, to the sponsorship from tobacco companies, this year is one of the turning point of the motorsports history. 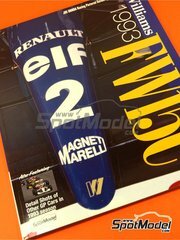 JOE HONDA Racing Pictorial Series by HIRO No.40 : Williams FW15C 1993 also featuring detail shots of other GP cars. After a year’s rest, Alain Prost continue his races in the Grand Prix circuits, with the powerful partner Williams FW15C, which had been predicted to be a overwhelming power on the circuits. However, the first half of the races were supressed by his rival Senna and the wet circuits, the penalties of flying start and the active suspension of other teams’ vehicles affecting the scores he gained, and the young teammate Damon Hill was climbing up the top of the score board, the fight for the championship become vigorous. Prost took back his pace from the mid-season and achieved a career high 4 constructive wins, and finally the overall championship of the year, as the present for his retirement. Model Factory Hiro signs this mind-blowing 1/12 scale kit: the rims are fully broken up, with all pieces chromed one-by-one; the engine, in white metal, includes even fully articulated pistons and rods; tyres are rubber moulded, and the bodyworks comes in gloriously moulded white resin. An astounding kit that will certainly become legendary. 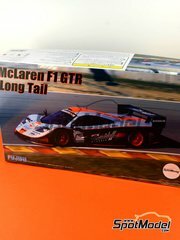 This is THE KIT we were all waiting for several years ago, nothing less than the 917 in 1/12 that mimics the white color model driven by Elford and Ahrens in Le Mans 1970. A good pile of resins, white metal pieces, photoetches, awesome instructions, gorgeous decals, and more and more and more, making the building of this Model Factory Hiro wonder a real pleasure. 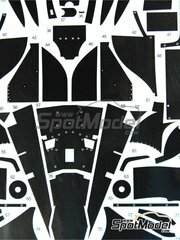 Two complete decals sheets with carbon fiber patterns for the cockpit, engine areas, monocoque, spoilers, and many many more. 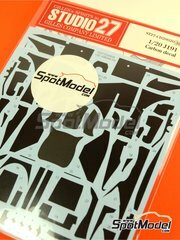 Stop trimming carbon fiber decals by hand and indulge yourself using these perfectly fitting ones from Studio27. 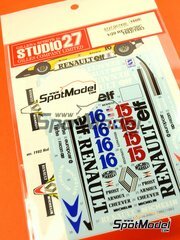 If you want to refresh your Tamiya Renault 30B, or if you just want to recreate the 30C version decoration (which is NOT included in the box), don't hesitate and use these gorgeous decals from Studio27, re-edited for a very short time. This decals set includes the whole decoration for all the 5 grand prix raced by this car: Mexico, South Africa, Brazil, Spain and San Marino. Forget the yellowish decals of your old box and give your kit the look it deserves. Freshly printed by Tabu, here are the decals with all the sponsor logos of the Lotus 107 in its San Marino and Monaco versions. 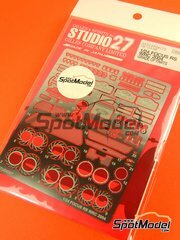 Just a perfect replacement for your old and yellowish decals from your Tamiya kit. New and freshly printed decals with all the Lotus 107B sponsors logos, also including the test version. 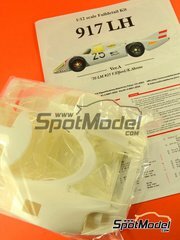 The best choice for replacing your old and yellowish decals from your Tamiya kit. 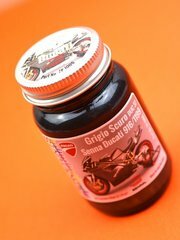 Do you want to build the Senna version of the Ducati Panigale? This bike used a dark grey specifically formulated by Ducati, that Zero Paints has now precisely replicated to make your kit look exactly like the actual bike. Grids, brake discs, bonnet pins, belt buckles, Japan rally badges, wipers, plates... What else do you want? The red fabric for the seat belts? Even that is included. Modern Formula 1 have the carbon fiber as a fundamental component. 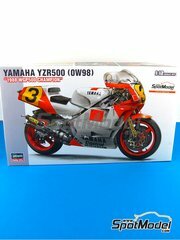 And what happens to your scale model? How could you not use these precious carbon fibre patterns that Studio27 has just reissued for a limited time? Watch out! Decals for the Tobacco sponsors are NOT INCLUDED in the kit. Here's the FIA approved version of the Lamborghini Murcielago. In addition to a full blown parts break up, the kit also includes an awesome decals sheet printed by Cartograf. But once you finish building... you can't help but staring at it every day! 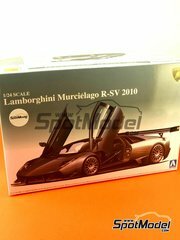 Finally the FIA approved version of Lamborghini Murcielago sponsored by All Inkl. 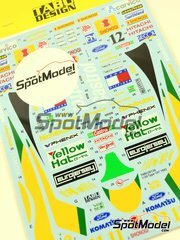 In addition to a carefully designed parts break up, the kit also includes an awesome decals sheet printed by Cartograf. Think how greak it will look in your showcase! 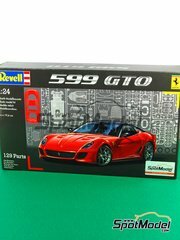 Inside the box you'll find everything you need for building one of the most beautiful cars of the last years. 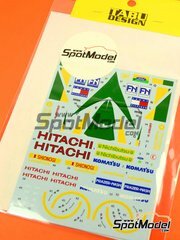 EMI decoration is very nicely developed, with a thorough decals sheet and every detail you could need. The kit also includes photoetches for further detailing.